Purple, White & Pink Frosted (faux) Pearls embellished with Pink and Magenta Flowers on brass-plated wire, with brass-plated clasp, bracelet. A stylishly beautiful addition to any fashionista's fashion jewelry collection! 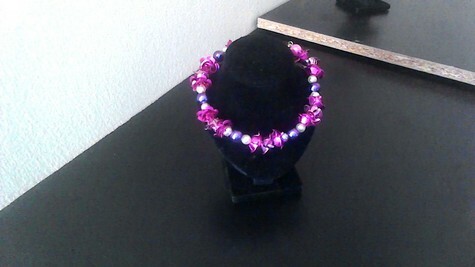 Purple, White, Pink Frosted (faux) Pearls with Magenta Flowers beaded silver-plated clasp bracelet. White, Purple, Pink (faux) Pearls with Pink & Magenta Flowers silver-plated clasp bracelet. STYLISHLY BEAUTIFUL!